Listen up: OrigAudio's Fold and Play Recycled Speakers and Designears. A mere three months after Jason Lucash and Mike Szymczak started their company OrigAudio, they hit the jackpot. 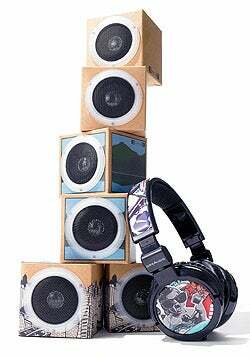 It was November 2009, and out of the blue, Time magazine called about featuring their Fold and Play Recycled Speakers among its "Best Inventions of 2009." Inspired by a Chinese takeout box, the ultraportable product--packaged flat and made entirely out of recycled materials--can be folded into a pair of cube-shaped speakers requiring no batteries or external power. It sells for $14.99. The day the article came out, they sold 1,500 units (before that, their daily best was 10). Just prior, they'd received an order from the Marines for 50,000 Fold and Plays, launching OrigAudio's corporate gifting division with a bang. By Black Friday, the first batch of inventory was gone--resulting in an emergency air-freight shipment from their manufacturer in China to fulfill Christmas orders. No one saw it coming. They were 26, working full-time in marketing at backpack and luggage company JanSport in California. "We knew we would start a business down the road. We just came up with portable speakers because we were traveling for work and got tired of lugging around heavy speakers with D-cell batteries," Szymczak says. They left JanSport in early 2010 and set up shop in Chicago to focus on OrigAudio, where Szymczak serves as director of marketing and Lucash is director of business development. Soon, they debuted their signature product: Rock-It, a palm-size, battery-powered device, selling for $34.99, that turns audio from music players into vibration sequences and connects via adhesive pad to almost any object--windows, water bottles--to turn it into an impromptu speaker. Besides Rock-It and Fold and Play, OrigAudio's catalog now includes customizable speakers called Cubicool ($49.99 for three); the Volcano ($24.99), a capsule speaker with a vacuum bellow that mimics the resonance of a subwoofer; and the popular Designears ($69.99), over-ear headphones that can be customized with user-supplied artwork. They haven't spent a dime on advertising, instead relying on social media, word-of-mouth and affiliate programs, with a retail strategy that began at mom-and-pop stores and worked up the chain as sales improved: $700,000 in 2010; $2.5 million in 2011; and a projected $5 million this year. OrigAudio products are sold in 5,000 retailers, including Bed Bath & Beyond and Zumiez, and in locations as far-flung as Japan, Germany and Australia. Last year the company moved its base to Orange County, Calif., to be closer to the action sports market, and hired its first employees (now there are 12), in anticipation of a push into major retailers like Restoration Hardware and Costco.com. Szymczak attributes success to public demand for portable, affordable, eco-friendly things. "We listen to feedback, and we can relate," he says, revealing the latest, as-yet-unnamed product, created in response to demand for a "Rock-It on steroids." He plugs a cord from a barrel-shaped speaker into a couple of Rock-Its daisy-chained together, each attached to an empty shipping box and connected to his iPhone. He sticks another cord end to the glass tabletop and hits play. It's loud. The music sets the (reclaimed) wooden barn doors that lead to an adjoining office vibrating. Lucash is pleased. "Not a bad sound system for under $100, right?"